G12 Circular Pocket Milling CW / G13 Circular Pocket Milling CCW (Group 00) These two G codes are used to mill circular shapes. They are different only in which direction of rotation is used. Both G codes use the default XY circular plane (G17) and imply the use of G42 (cutter compensation) for G12 and G41 for G13. These two G-codes are non-modal. I value must be greater than Tool Radius, but less than K value. NOTE: If no cutter compensation is desired, a D00 must be specified. If no D is specified in the G12/G13 block, the last commanded D value will be used, even if it was previously canceled with a G40. The tool must be positioned at the center of the circle using X and Y. To remove all the material within the circle, use I and Q values less than the tool diameter and a K value equal to the circle radius. To cut a circle radius only, use an I value set to the radius and no K or Q value. 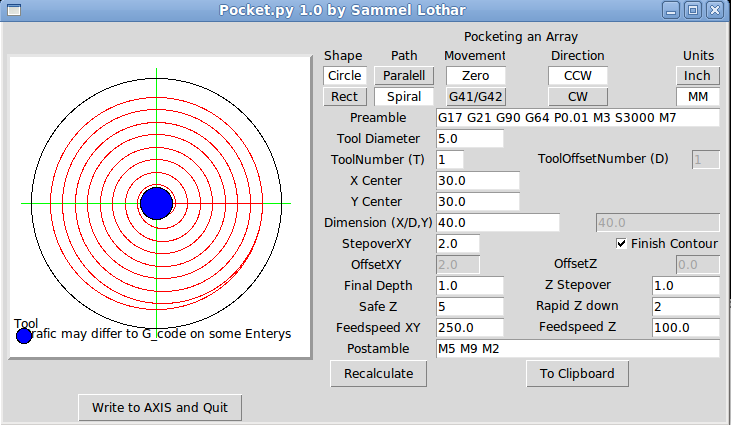 Circular Pocket cycles simplify the programming required to mill out a circular pocket. When executed, the CNC rapids to the center, rapids to the StartHgt?, then ramps into the work while circling outward. Once the tool reaches the pocket Diameter, the tool circles back toward the center until the pass is complete. The Circular Pocket Cycle automatically compensates the tool’s diameter. The correct tool diameter must be activated before or within the CircPock? block. If DepthCut? is keyed in, the CNC executes the number of passes required to get from the StartHgt? to the ZDepth, cutting the DepthCut? on each pass. NOTE: The program editor will allow the operator to write a block even if the positions keyed in are illogical. The control will stop a program and generate a message at an illogical block for safety. Test programs with Draw to find any illogical blocks. When FinStock? is used, the CNC leaves the specified stock on the profile and depth for a finish pass. The profile is cut to the Diameter and ZDepth dimensions on the finish pass. If a negative FinStock? value is keyed in, CNC will leave the finish stock and not add a finish pass. XCenter X coordinate of the center. If no coordinate is entered, pocket is centered at present position (optional). YCenter Y coordinate of the center. If no coordinate is entered, pocket is centered at present position (optional). NOTE: It is recommended the desired absolute center coordinates be entered when possible. StartHgt? The absolute Z position the CNC rapids to before feeding into work (value required). NOTE: StartHgt? is 0.100 inch (2.0 mm) above the surface to be cut. ZDepth The absolute depth of the finished hole (value required). NOTE: ZDepth must be lower than StartHgt?. Direction This setting allows the operator to choose between a clockwise (Cw) or counter clockwise (Ccw) direction. The setting is toggled by using the (+/-) key (selection required). Stepover Width of cut. If no value is entered, CNC defaults to 70% of the active tool radius. Maximum stepover permitted is 70% of the active tool diameter (optional). NOTE: The program editor will allow the operator to write a block containing a Stepover value greater than 70% of the active tool radius. Testing a program in the Draw Graphics Mode will reveal this type of error. DepthCut? Depth the machine takes in a single pass. Defaults to a single ZDepth cut minus the finish stock if no position is entered (optional). FinStock? Amount of stock left by the machine before the finish pass. Zero is assumed if no value is keyed in. If a negative value is keyed in, the CNC will leave the stock, but not make a finish pass (optional). RoughFeed? Rough pass feedrate (optional). FinFeed? Finish pass feedrate (optional). you can G41 D(tool) to the Final Circle!